Whoa! 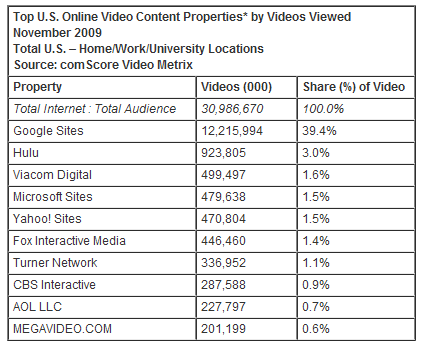 According to comScore, 30 billion videos have been viewed online in November 2009. So, it’s either most people are watching one of those user-generated video showing the most funny human experience or viewing movie trailers of upcoming blockbuster movies. Drilling deeper into the comScore data, we’d learn that 39% of these videos viewed online were from Google Sites, 99% of which are hosted on YouTube. Now here’s the interesting fact, Hulu is at distant second getting only 3% of the 30 billion videos viewed online. But that is understandable since Hulu is not accessible worldwide. So, its either time for Hulu to open up globally or have some new video site that is worthy enough of challenging YouTube. Looking into the Top 10 Video Content Provider though, the list becomes different. Google Sites is still at no.1 with around 129K unique viewers, followed by Yahoo Sites, Fox, CBS and Hulu. The top video ad networks in terms of their actual reach delivered were: Tremor Media Video Network with 20.0 percent penetration of online video viewers, BBE with 17.5 percent, and BrightRoll Video Network with 16.6 percent. The average online video viewer watched 12.2 hours of video. 128.1 million viewers watched more than 12 billion videos on YouTube.com (94.3 videos per viewer). 38.6 million viewers watched 333.4 million videos on MySpace.com (8.6 videos per viewer). The average Hulu viewer watched 21.1 videos, totaling 2.1 hours of videos per viewer. The duration of the average online video was 4.0 minutes.